Arroyo Seco Parkway National Scenic Byway Interpretive Plan produced by Engaging Places for the Mountains Recreation and Conservation Authority in May 2012. 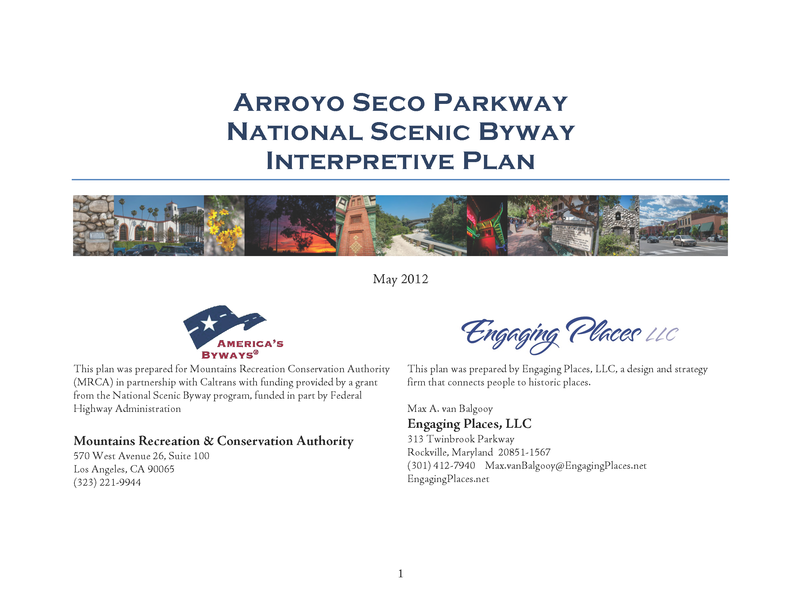 If you’re interpreting a group of sites or a heritage area, you might be interested in reviewing an interpretive plan I completed earlier this year for the Arroyo Seco Parkway National Scenic Byway. When the Parkway was completed in 1940, it connected Los Angeles and Pasadena and began southern California’s Freeway Age. It’s also a region that has a dense concentration of museums, historic sites, parks, historic Main Streets, architectural landmarks, and unique businesses, including the Gamble House, Huntington Library, Lummis Home, Heritage Square, and Olvera Street. To bring attention to these cultural riches, the Mountains Recreation and Conservation Authority commissioned me to develop this plan and work with a local stakeholders, build on an inventory of assets developed by the National Trust for Historic Preservation, and integrate audience research conducted by the Community Land Use and Economic Group and Decision Support Partners. This entry was posted in Community engagement, Cultural diversity, Historical interpretation, Strategy and tagged Arroyo Seco Park National Scenic Byway, California, Gamble House, Heritage Square, Huntington Library, Los Angeles, Lummis Home, Olvera Street, Pasadena on September 6, 2012 by Max van Balgooy.